"Erica Shirts is a gifted young teacher with the knowledge and passion to nurture young violinists to a level of excellence." 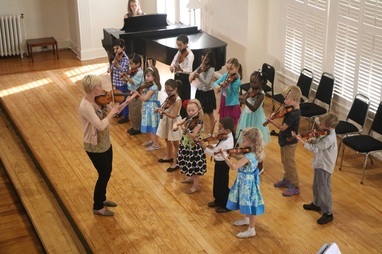 As Director of the Duke University String School in Durham, North Carolina, Erica teaches private lessons, violin group classes, and chamber music. 'DUSS' trains students ages 5 –18 of diverse backgrounds on violin, viola, cello, and bass in the region's premier string education program. Before joining the String School in 2015, Erica was on the faculty of world-renowned String Academy at Indiana University where she had a thriving studio focused on correct technique and beautiful tone within a judgement-free atmosphere. She received pedagogical training from Mimi Zweig as well as Suzuki certification. If you are interested in your child joining the Duke University String School, please visit the DUSS website HERE. Erica, a native of Utah, is currently the Associate Concertmaster of the Fayetteville Symphony occupying the Berte Dean Carter and A.A. Howell Chair and is also active in the North Carolina Symphony, North Carolina Opera, and regularly plays violin and viola in chamber performances and with the Chamber Orchestra of the Triangle. In the past, Erica has performed as Principal Second Violin of the Indiana University orchestras and as a member of the Lansing Symphony in Michigan. Erica has enjoyed working with conductors such as Grant Llewellyn, David Effron, Cliff Colnot, Carl St. Clair, Andrea Quinn, Timothy Muffitt and Kenneth Kiesler. She also regularly plays chamber music on the violin, as well as the viola. After receiving her Bachelors of Music at the University of Michigan, Erica gained a Masters in Music as well as a Performer Diploma from the Jacobs School of Music at Indiana University. She has primarily studied violin with Mimi Zweig, Aaron Berofsky and Gerald Elias, as well as Quartet studies with the Pacifica Quartet and Orchestral studies with Jorja Fleezanis and Steven Shipps. She is also the founder of StringPedagogyConnect.com, a database of teachers who have received pedagogical training from Mimi Zweig.